An almost-daily ritual of ours involves driving the car up the driveway. Sometimes I stop as I'm coming into the driveway and one child might climb into my lap. Other times the kids hop out and get the mail. Hannah might grab the garbage bin while Joseph gets up on my lap and steers the car into the carport. Sometimes one child drives while the other one patiently waits their turn and observes from the passenger seat. 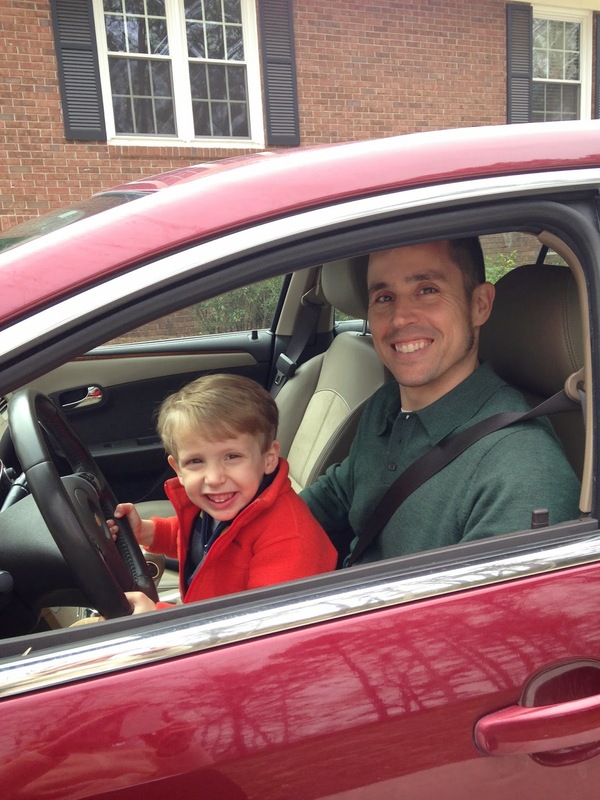 When the kids were smaller, it was mainly Daddy who let the kids drive on his lap. I have many pictures of Hannah driving with him. It was a highlight of her day, him getting home from work. But as they've gotten older, I've gotten in on the fun. Even after all these years doing this family ritual, it is still a highlight of their day when they see Daddy coming home from work. 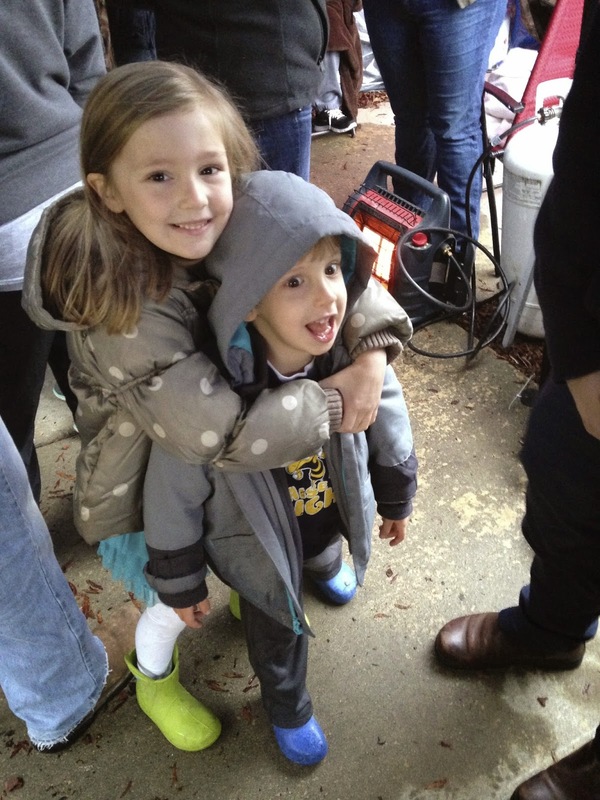 We will be out playing, riding bikes, going for a wagon ride… The kids get so excited, rushing to his car. Hopefully you don't think we're careless parents. I will say that we are very cautious and Joe is always watching for the children. But this is a memory I have of when I was little - driving on my daddy's lap. I hope it's a memory Hannah and Joseph will cherish, too. Another thing these children love is helping me when I'm a greeter at church. I can barely hand a bulletin to anyone; they are very eager to take care of that for me! They are very social and know most people by name. I love how much they like to help. It was French toast sticks day. The day after Hannah turned 5 1/2, she was up and moving fast (as she always is on Tuesday mornings) eager to make it to school on time for breakfast. Since Daddy was out of town, I spontaneously decided that Joseph and I would join her. Little #1 Best Brother on Earth was thrilled. So was big sister. 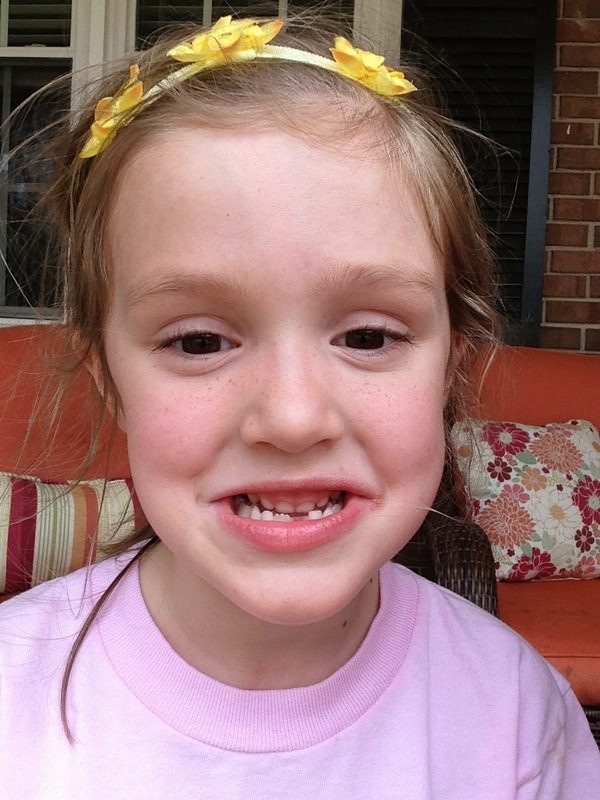 Wednesday, March 11 - A second lost tooth! This one was loose for a little while. Every day she asked me to check on it. I would wiggle it and guess how much longer I think we had. Finally, it was so loose I told her I think I should pull it out. She wanted me to at first, but was a little nervous. I wiggled it with a paper towel, but it wouldn't come. It was hanging on on one side. Later in the afternoon she was sitting on the swing, and I tried again. It hurt for a second and she put her hands up to stop me, but the tooth was already out and in my fingers. She was quite excited! Most of her practices were rained out, but this day she actually got to practice and was thrilled to be doing so. I think they might have gotten two practices in before the games started the following week. That's my sweet friend, Rebecca, above. Her son, Weston, and Joseph are BFFs. Joe and I took shifts this year camping outside the Board of Education to get Joseph into Pre-K. It was a cold, rainy night…but it was worth it! We were spot #19 in line (54 spots were available). Joseph gets to go to Hannah's big school in August and he's over the moon! Daddy read Cloudy with a Chance of Meatballs. A few weeks ago Hannah and I checked some books out from the library. There was a few they really liked (this one, Madeline and Love You Forever), so we had to renew them. The Saturday after St. Patrick's Day (and Joseph's accident), Hannah and I had some princess fun at a Frozen-themed birthday party for her friend, Gabby. 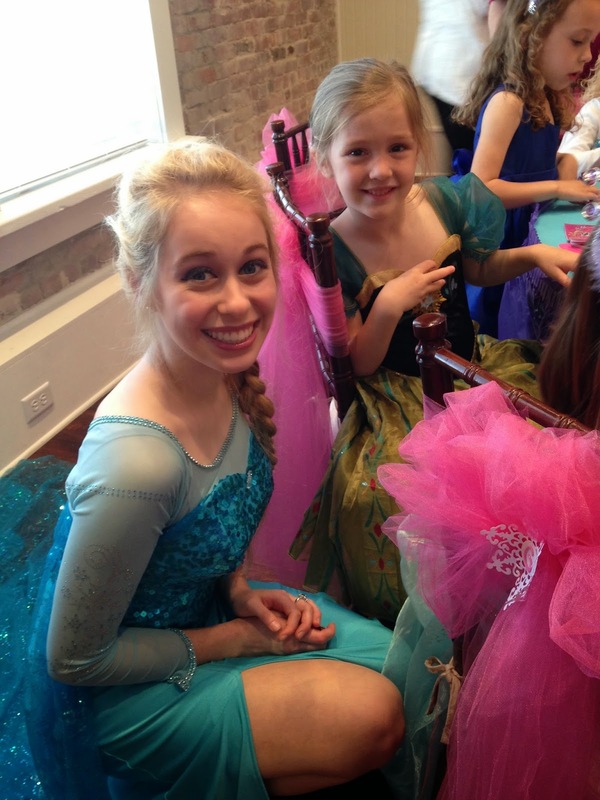 My Anna got to meet Elsa, who was so nice and sang all kinds of Disney princess songs. That was one excited room of little girls. 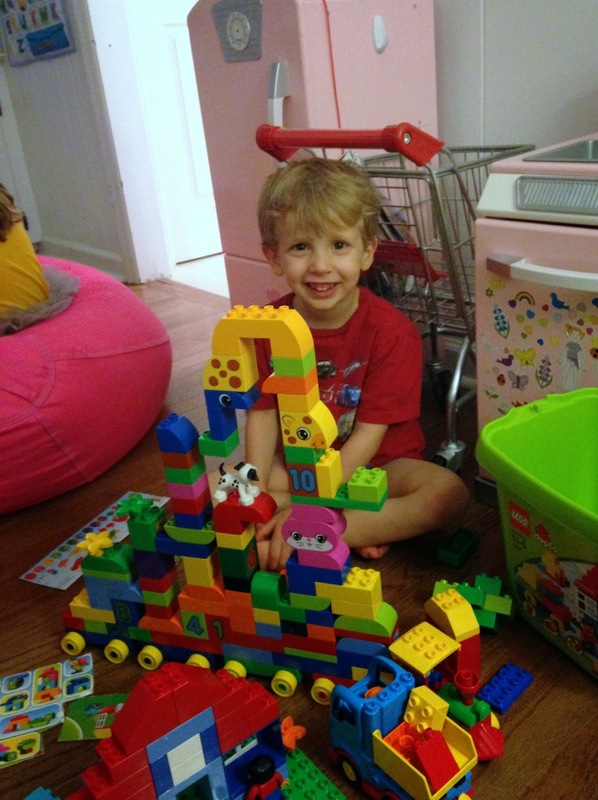 In between trips to the doctor, Joseph built lots of buildings, towers, and trains. 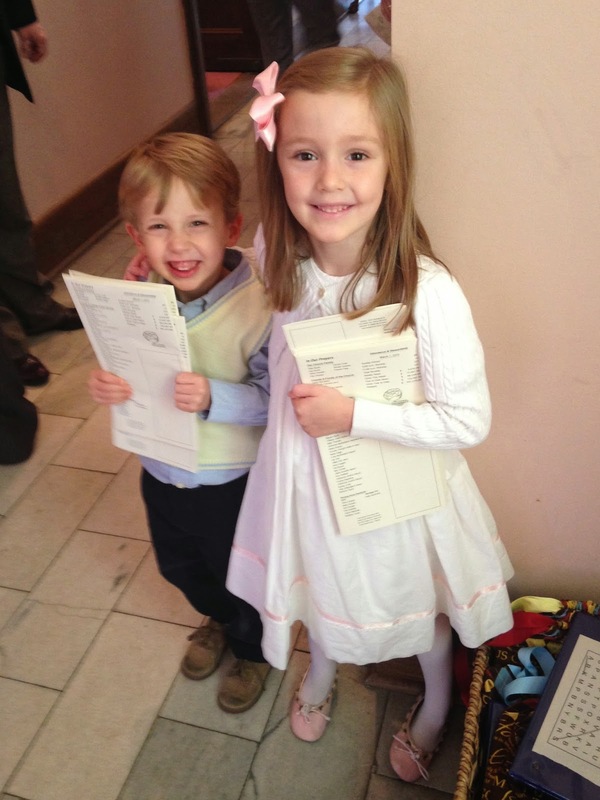 Hannah and Joseph both have spent the majority of their time indoors playing with Legos and putting puzzles together. Most of the time they play nicely. It's just when someone's got a piece that the other person "needs" that we have a problem. So, yes… things haven't exactly been great with the head injury. 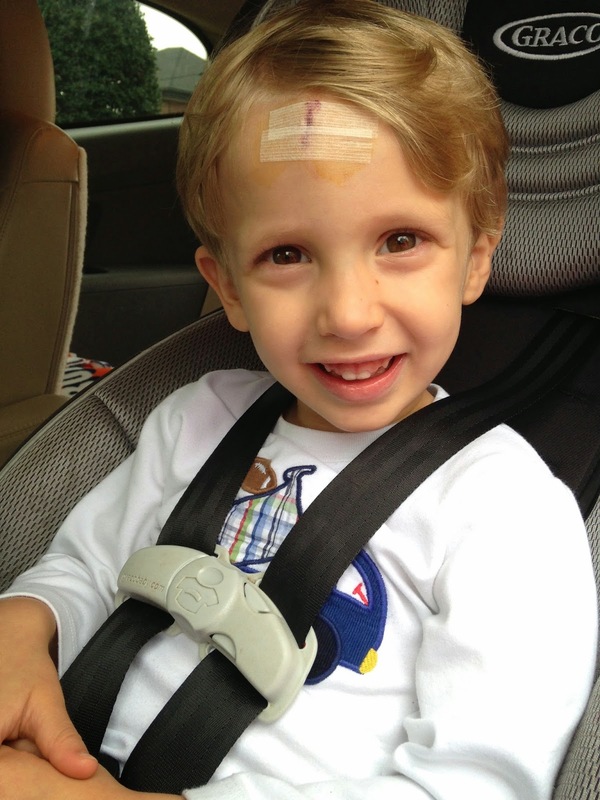 At preschool Joseph and another (not-so-little) boy collided heads in the classroom, re-opening his wound… right in the center! 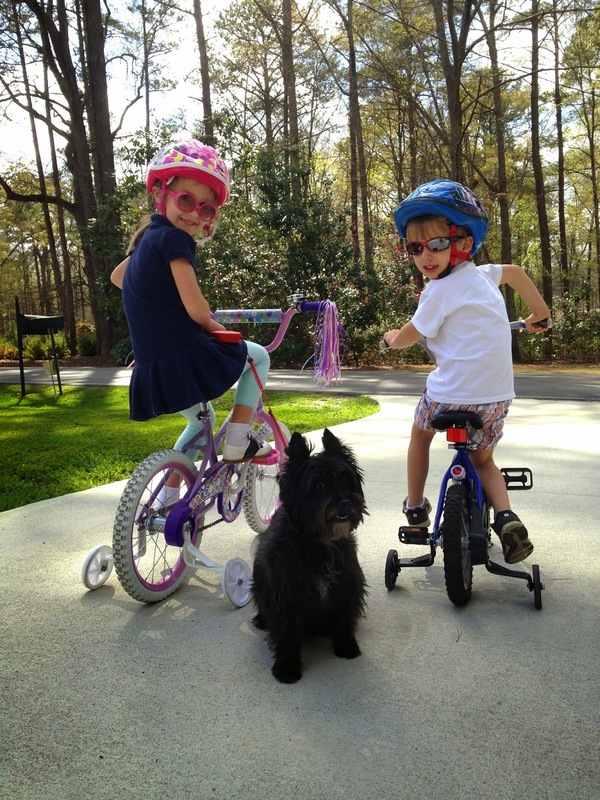 It was a beautiful, sun-shiny day and the kids begged to ride bikes. We decided to take Mollie, too, since it was her birthday. Cannot believe she is 10 years old. She was a puppy when Joe and I started dating! Our friend and surgeon, Rob, had to reassess Joseph's wound after he bled through the steri-strips. He was cleaned up and a larger strip was put on. So far, so good and it's still on. 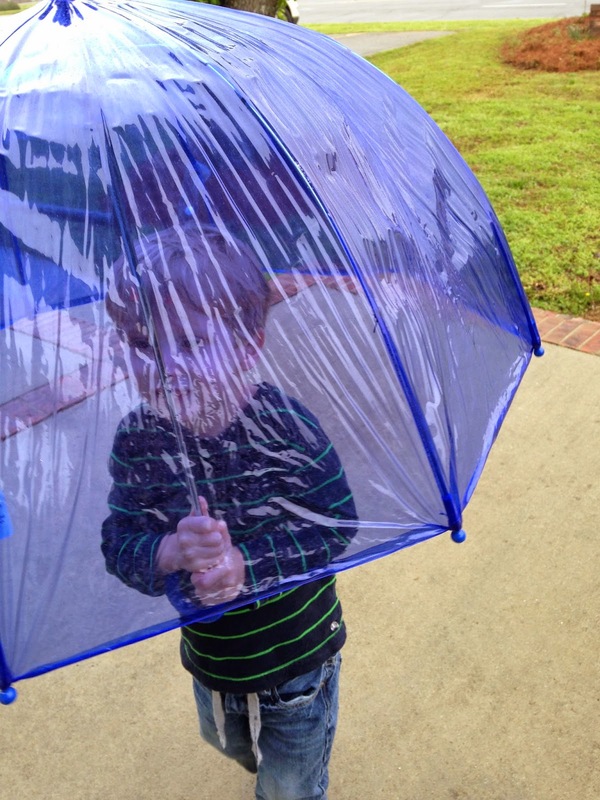 And, let me just add, that Joseph is obsessed with his umbrella, so he was excited to be out and about in the rain. Hannah played goalie for the first time and did great! She also played defense and "runner" which she likes best. She was all over the field. She really likes soccer and we are so glad. Such a fun sport to play and watch. And we love to watch her do anything that involves running. Long-legged, exuberant cuteness. That brings me almost up to date. March has flown by!